15FT LMR195 cable N Female to SMA Male by DigiWave at Andy Pemberton. MPN: WL6043. Hurry! Limited time offer. Offer valid only while supplies last. WL6043 Features: -Color: Black. -N female to SMA male LMR195 cable. -Extends the distance between wireless antennas and wireless networking devices. WL6043 Features: -Color: Black. -N female to SMA male LMR195 cable. -Extends the distance between wireless antennas and wireless networking devices. -Heavy duty connectors allow for optimum durability and connectivity. 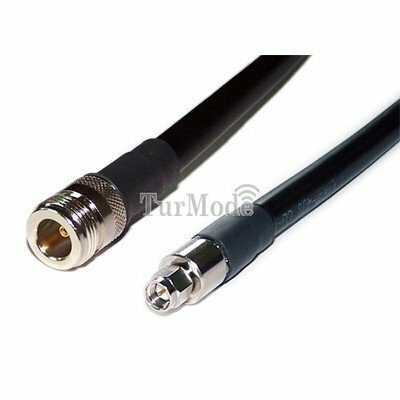 -High quality, low signal loss and premium antenna cable. -Ensures flexibility without reducing performance. Product Type: -Cable Management. Connector: -Adapter cable. Quality: -Best. Dimensions: -Cable length: 180". Overall Height - Top to Bottom: -1". Overall Width - Side to Side: -8". Overall Depth - Front to Back: -8". Overall Product Weight: -1 lbs. If you have any questions about this product by DigiWave, contact us by completing and submitting the form below. If you are looking for a specif part number, please include it with your message.